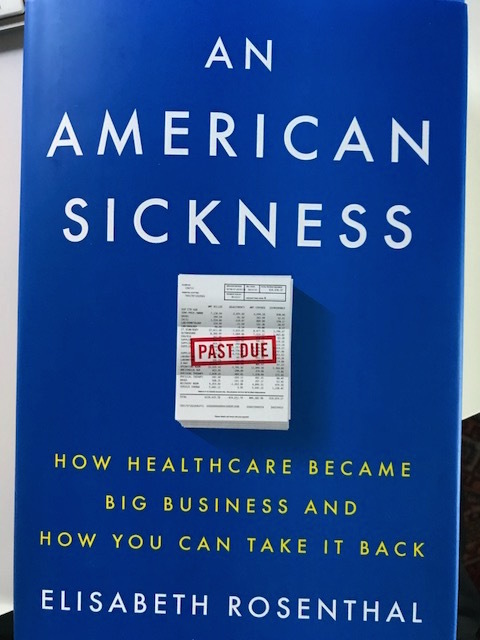 Thanks to Elisabeth Rosenthal, MD for the mention of the ABIM/ABIM Foundation controversy in her new book, An American Sickness: How Healthcare Became Big Business and How You Can Take It Back. Sadly, the financial troubles and numerous financial conflicts of interest at the ABIM persist for reasons Dr. Rosenthal articulates well: it's a "testing Ponzi scheme." Your board certification has come to be worth no more than your seat ticket on United. It can be pulled to satisfy whatever private corporate whim "dr" Baron feels is needed. They have more than demonstrated that they will involve their personal goons as well as the legal and legislative system to achieve their baseless aims. Doctors are just as powerless as airline passengers in spite of all claims that the board certification system is "voluntary". Indeed, I am suprised Pearson Vue hasn't installed body scanners at the ABIM test centers. For the particular reason that it psychologically puts physcians in their place - subordinated to the all powerful ABIM. Honorable mention, albeit superficial, in Rosenthal's "American Sickness" is given to Christine Cassel, who does not participate in MOC. This non-participation on the part of Dr. Cassel sums up the objective value of MOC and the hypocritical attitudes of the money-grubbers at the ABMS and ABIM in particular. ABIM and ABMS! Nothing more than racketeers participating in a grand Ponzi-style testing scam to enrich themselves. They don't care a bit about the profession or the public. The ABIM and their ABMS cronies are pure profiteers serving special interests. For decades they have been fulfilling corporate and political agendas. They've gotten greedier and greedier and more hungry for power. We agree, it is time to take-back medicine from this corrupt generation of vipers and hawks who pass themselves off as doves. We agree with Fisher and Kroll. The volatile financial practices, abrasive propaganda and abusive bullying of the ABIM constitute more than mere malfeasance. ABIM's actions and financial chicanery borders on the criminal; it is the worst medical education scandal in the history of the US. It needs to be investigated. Look at the punitive measures and wars they secretly created. The ABIM and ABMS created hellish fires for physicians to jump through -- burning hoops with a snapping whip. None of this has anything to do with quality assurance. It's all about control. Physicians pay dearly to wear those ABMS MOC trademarked nose rings. I agree with Ms. Rosenthal, who I understand works for the Kaiser Family Foundation, that something needs to be done. So, what are we going to do about it? Most important right now is to support the anti-MOC movement and to win the battle in the state assemblies to get clear-headed unambiguous antic-MOC legislation, which ends mandatory MOC once and for all. The ABMS, in league with the insurers, hospitals, and quality assurance cartel, need to be put back in their places. Otherwise healthcare in America is doomed. And with its demise America will be doomed. Overly burdened with useless tasks and time-consuming side-steps imposed on them, physicians are already quickly falling into the ubiquitous assembly line of production to become "sweat-shop click-clerks" for an elite party of corporate masters who pull the puppet strings. This corpus of oligarchs will fight and maim, if necessary, to get the desired ever-elusive growing bottom line. What is happening to certified and non-certified physicians and their patients is grossly unethical. I would like Ms. Rosenthal to join in the fight to get anti-MOC legislation passed in every state. Otherwise there will be nothing left to fight for, not just in healthcare, but in every facet of our civil liberties, fair commerce and in our precious personal lives. This really is our Alamo - the nation's battle for integrity and fairness. The anti-MOC movement is ultimately about the physician-patient relationship. It is increasingly difficult to truly serve the patient when they are being systematically undermined by the deceitful process of undermining physicians, thereby bullying the core of the healthcare system into submission. It is fight or die. Conflicts of interest and criminality will become institutionalized to the point of no return unless we fight. The facts are in about the ABIM. The ramifications of mandated ABMS MOC, and the evil threats to patient and physician it represents, cuts through the chase, revealing of our many essential problems as a nation. Many of those problems of excess and corruption are encapsulated in a Walnut Street nutshell. The anti-MOC movement almost inadvertently has become an anti-corruption campaign in America. The anti-MOC forces are a microcosm of that all important universal fight of renewal and healing. The anti-MOC/anti-corruption movement is shining a bright light on our many problems as a nation, both foreign and domestic, and what kind of concerted efforts are needed to restore human decency, fair commerce and true collaboration. If you look at the ABIM financial numbers alone, it's easy to see the malfeasance. But when you look at the whole of the ABIM, which an IRS investigator should do, you see that there is a pattern of public fraud and self-dealing that emerges. It is not financial sloppiness, because it is clearly intentional. The ABIM used physicians' fees improperly to pay for obscene compensation packages, luxury condos, air travel, and other outrageous perks. The ABIM created a system clandestine bullies, quasi-militant secret surveillance police with "investigative activities" directed by a double felon. This double felon was thrown off of the police force. And the typical non-transparent ABIM modus operandi (and ABMS who knew full well what they were all doing) gave no public announcement warning the public and their clients about the hiring of this former public service abuser/violator, who tested positive for civil liberties violations against reporters/civilians and much more. Withholding this information was not an act of giving a person a third, fourth or fifth chance to behave, but it was a crime against hard working human beings, because of the damage it has done to thousands of physicians. It is a destruction of fair honest communication. With the ABIM's breech of trust it has created it has put a great quality chasm between the entire ABMS and its certification processes. Such malignant alter-egos with a license to create mayhem and totalitarian overreach were allowed and invited into a "new" corrupt ABMS system with the intent purpose of controlling physicians and paying for it all by gouging them financially. The cost of conducting this kind of chicane business at the ABMS was enormous and so they created the next iteration of their cobbled-together-from-disparate-parts monster Frankenstein under the trademark of "Mr. MOC". The CEO's, other key executives and officers have abused and used the organization writing their own new self-styled set of bylaws and policies as needed. In re-writing the new bylaws and policies board officers and their groomed executives altered the mission of the ABIM to be unbound from serving the patient and medical profession, but turned reality upside down to create a new organization and "work force" primarily there to serve special interests. The new breed of "executive for-profit takers" were no longer "officers of goodwill and charitable givers". They came in to ravage the system like "opportunistic carpetbaggers" with arrogance and a sense of entitlement. The highly-groomed and political-minded executives abused their lax unvetted, unfettered positions and financial support to sport political agendas having nothing whatsoever to do with the core mission and stated purpose of a non-profit testing company such as the original 1936 ABIM proffered. In fact, the IRS does not allow such unbridled politicization and self-dealing to exist in the United States in its non-profits. Yet, this Dr. Jekyll turned Mr. Hyde illicit experimentation, and highly political social engineering, created the inside-out topsy turvy reality which persists and flourishes as the norm at the ABMS and throughout the quality assurance cartel today. These kinds of dishonorable and deceitful practices are also systematic and systemic within the entire ABMS and it has gone on for decades. The problems are not as difficult as are the personal entanglements, financial intrigues, and political conflicts of interest that prevent elite professional medical politicians, non-medical politicians, risk managers, and their Wall Street financial advisors from working together to do the right thing. What the ABIM has done with their testing overreach is provide us with some of the most unfortunate examples of heinous and reckless legal attacks. These attacks were based on mostly fabricated/highly misconstrued information and inflicted on physicians by executives personally entangled in it all financially and politically. The buildup to this whole nightmarish affair that has been going on for nearly a decade now led to the quasi-militant about-face of the ABMS as a consolidated force for corporate power. The ABIM has as far back as I can remember never had a good image. I'm not sure that its lack-luster facade and myth of being a gold standard ever cut much mustard. In fact the ACGME and ABMS always gave one the flavor of ten shades of fear and intimidation. It became clear to most observers that such cunningly planned violatory legal acts against competing preparatory board courses and physicians have played a significant part in creating a civil war in medicine. It is a less than civil engagement perpetrated by a bloated arrogant dated bureaucracy and a beleaguered rank-and-file physician work force that is struggling to find time for a patient. Such illicit spying, improper sanctioning and suing with such a fool-hearty militant psychology and felonious overreach that went along with it, gave the world an extended negative view of the ABIM. Dr. Salas Rushford's persecution created a deepening of the divide in this conflict and civil war in medicine. It is clear to 99% of physicians that the stubborn failure of a group of elites whose obscene paychecks and greed prevent them from sharing in the joy and doing the right thing, which is to end mandatory MOC. The psychology of the ABIM becomes more and more cloistered in postures of propagandist slogans, PR spin, and a state of overall defense. The ABMS has nothing to do with being a gold standard in anything that matters to patients and physicians. ABMS exists only because it is the uni-standard created through cobbling together a network of NGOS committed not to quality, but to the reign of quantity. Dollars and political influence achieved through unfair trade and other illicit means. ABMS got to where it is today at the top tier in business through political collusion, financial conspiracy and blatant corruption. It is more than embarrassing when you learn who the "trusted partners" are, it is overtly obscene. More troubling evidence of strong potential conflcits of interest at the ABIM. Does Ed Rendell have influence at the ABIM not just through Ballard Spahr, but through the new chief of staff? She is also chief of ethics and director of human resources. It appears Judi Cassel's husband, a politically charged/history professor and president of the faculty senate at Philly's Arcadia University, is very close to former governor Ed Rendel. Maybe too close. This is troubling knowing how politically charged Ed Rendell is, if Judi Cassel being hired as chief of staff for Dr. Baron is a political appointment. Cassel has no history in healthcare or quality assurance. What else could it be other than to peddle good old fashioned political influence and lobby for special interests in the style of Ed Rendell. He has his big hands almost everywhere. So, how did ABIM choose Judi Cassel as the new chief of staff to Dr. Baron? We don't get any facts out of the ABIM ever. Was it possibly because of the former chief of staff, Suzanne Biemiller, who worked with Judi Cassel at the mayor's office together. Biemiller failed to disclose, or ABIM failed, that Biemiller's husband was a key executive at Philadelphia's Glaxo Smith Kline offices. Or was it a close relationship with Ed Rendell? Most likely both reasons and they both point to a politicization of the ABIM. Cassel's husband is a close political associate/friend of Ed Rendell. They teach an ongoing class together at University of Pennsylvania on election politics. They are both strong active Democrats. The conflicts of interest at the ABIM keep piling on - conflict after conflict. It is a coi factory. So maybe it really does matter who pays a lobbyist like Ed Renell. And it does matter who paid for the DNC 2016 in Philadelphia. It really appears more clearly than ever that Suzanne Biemiller was a political and healthcare industry-friendly choice and obvious Biemiller was not chosen for her medical background, which was ostensibly zero. But then her husband is a principle executive with Glaxo Philadelphia - they most likely have healthcare realted interests and enjoy their shares in the company GSK together. he was all over it raising money, but would not divulge where from. We now know GlaxoSmithKline in Philadelphia put in $100K. Since leaving office governor Rendell has been active in politics and even lobbied for oil and gas, which goes against the Democratic Party norms. He has always been active in healthcare debate and reforms. "Governors also have a special opportunity to go through the revolving door," she said. "Having been the top executives in their states, they have fantastic name recognition. They have the capacity to speak from the public-interest sector, and it's not assumed they are doing it because of who's paying them." Earlier this year, attention focused on the consulting work of former Pennsylvania governor Ed Rendell after he wrote an op-ed in The New York Daily News, urging New York state officials to move forward hydraulic fracturing. Rendell had not disclosed, however, that he also worked as a paid consultant to a private equity firm with investments in the natural gas-drilling technique – an omission first noted by ProPublica. "Nothing I said in that op-ed piece was different from what I said as governor," said Rendell, who oversaw a fracking boom in Pennsylvania during his tenure. "I refuse to do anything, no matter what the money is, that's contrary to what I advocated in my public career," he told USA TODAY. "If I open the door for a client, I only open the door if I believe the goods and services they are selling are good for the city or state." Rendell's post-gubernatorial jobs include working as a special counsel at Ballard Spahr, his longtime law firm where he said he advises clients on government, energy and infrastructure issues. He also consults with a number of companies and sits on corporate boards." When Suzanne Biemiller left Mayor Nutter's cabinet to work for the ABIM one could see that the privatization of the gasworks project had taken a great toll on her. At the city of Philadelphia it appears that Suzanne did great work and we know of that work from the candid reporting of Nutter's administration. My perception of her time at the ABIM is that she did nothing there, because there was no visibility provided by the ABIM and Dr. Baron. Suzanne's departure was not announced either. I find that disrespectful and wrong. This lack of transparency allows for too much speculation. Dr. Baron did a good woman a disservice by not communicating candidly with his diplomates and candidates about her work and progress there. The communications officer appears to get paid for doing nothing. Baron's lack of leadership is killing the ABIM. If Ms. Biemiller was not a good fit for the opaque culture at the ABIM that worships the status quo of MOC then she is owed an apology by Dr. Baron in a public statement. It appears to me that Baron lacks any courage to really change the culture. Being afraid of real change at the ABIM is what will lead it to a very rapid demise. It is not just about ending the coercive MOC but about real ethics and real heart for people. Right now Baron to me is just a purchased man. If the ABIM is just a political front organization and special interests lobby, then Suzanne Biemiller was right to leave the organization. You can't compromise your ethics. The educational materials are sub-optimal and I'm not sure they can get it together to even produce a valid certification test. That is just a fact from knowing how the ABIM works. Either way Dr. Baron owes Ms. Biemiller the courtesy of a press release thanking her for her hard work "wanting to improve healthcare in America." If anyone has followed Suzanne's career, she has been a dedicated public servant sacrificing time with family in that pursuit to make a difference for many years. That can't be disputed. I really don't get Dr. Baron's lack of public face and his cowardice to talk about things from his heart. Strange to say this, but the ABIM has squandered so much time trying to turn the ABIM around with lip service; the end result is that nobody trusts the organization. And all they've done has just deceived the public. Look, the ABIM has no real MOC plan. Anyone can see that clearly. They just want to keep cheating and lying about their egregious conflicts of interests. They are just scrambling to keep the MOC money stream flowing. Suzanne, by the way, would have made a great CEO there and could have had physicians working as volunteers. In an ideal world, anyway. You have to cut the glut though. MOC is a big part of the glut. If the ABIM could not keep Suzanne Biemiller something is very wrong with the ABIM and not with Ms Biemiller. The corruption is worse than I thought. If Judi Cassel can't write a note on the ABIM website honoring Suzanne then she is just as much of a political puppet and useless special interests sell-out as Dr. Baron is. One should at least be decent to your friends and associates!